You can go to the settings screen by pressing the gear-shaped button located on the bar at the top of the menu screen. The free version allows you to use up to 10 files and up to 5 pages of a PDF. If you want to use more files or pages, then you will need to purchase an add-on. This option allows you to purchase it. The free version displays advertisements. If you want to remove them, you will need to purchase an add-on. This option allows you to purchase it. If the app is re-installed at any point, all previously purchased add-ons will be lost, and the app will be the same as the initial free version. If you press the restore button, the app will contact the Apple Store, and any previously purchased add-ons will be restored. 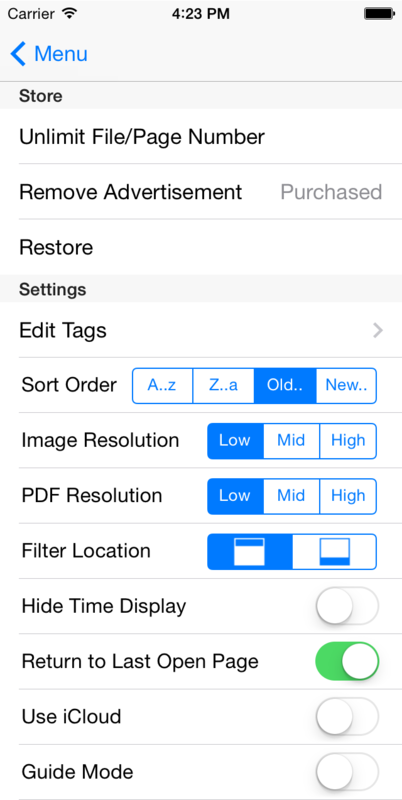 You can also use this option to have any add-ons purchased on your iPhone appear on your iPad, and vice versa. Takes you to the Edit Tags screen. You can erase tags or change their color. You can only erase tags that aren't currently attached to any files, so if you want to erase a tag, you will need to remove it from any files first. A-Z Sorts files in alphabetical order. Z-A Sorts files in reverse alphabetical order. Old- Sorts files by date, from oldest to newest. New- Sorts files by date, from newest to oldest. You can set this option to high in order to display more detail, but this may take up a large amount of memory. Only the low setting should be used on iPhone 4 systems. You can change the default setting for the location of the filter for the study screen. You can remove the status bar above the screen (showing the current time and network status) when in study mode. You will be able to use more of the screen this way. This option affects PDF files. The app will remember the last page you had open when you closed a PDF file. If this option is turned on, it will open to that page. With the iCloud, you can share files between multiple devices. If you turn this option off the app will run somewhat faster.